Everyone gets disappointed, and everyone deals with disappointments differently. Trust me, I am no better than any of you who may be reading this. It’s easy to say how one should act, or how one should feel, but unless we are walking in the same exact path and the same exact scenarios, we are all different and will never know what or how someone is dealing and living through. Yes, we may have lost a loved one at the same age, with the same disease, but not exactly in the same manner. Our circumstances are our own and therefore we can not or should not compare our story or situation to anyone elses. Losing a loved one causes us much more than just a feeling of ‘disappointment’, but I felt I needed to use a drastic example to get my point across. Whenever we are feeling alone or disappointed, we can all become sad, withdrawn, and sink into ourselves, but thankfully, we have God within us and beside us at all times. We have to remember, He is there holding our hands or carrying us through our darkest times. Yes, we could give into these feelings and continue to go down that deep dark hole and Satin would be very pleased with us. Wouldn’t it be better if when life disappoints us, we disappoint Satin by deciding to make the best out of our situation? A positive attitude is our most attractive asset and a very valuable thing to have. No matter what circumstance we are dealing with, it is our decision on how we handle life’s twists and turns. We can either choose to be joyful with a positive attitude and search as deep as we have to until we find a positive thing to be grateful for. There is always a positive in even the darkest of moments. 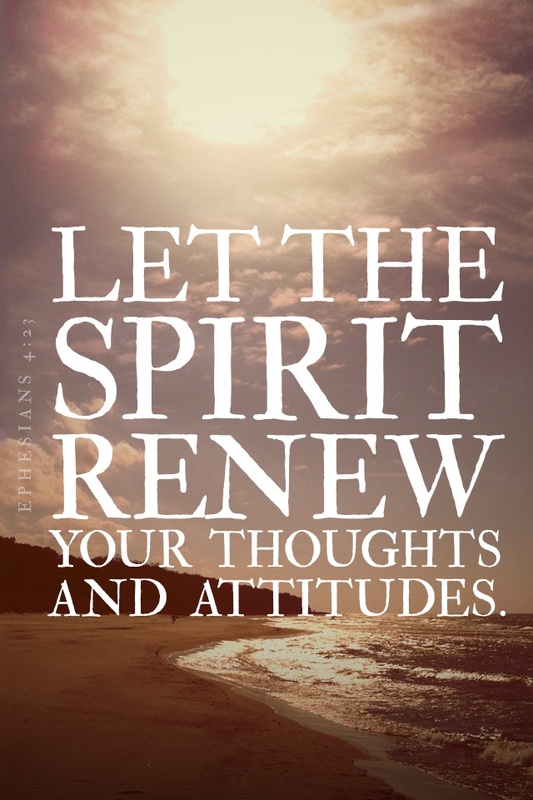 It is so easy to have a good attitude when everything is going our way, but if we want to grow in our spiritual maturity, we need to develop the ability to remain positive even during the storms of our lives. When we can master this challenging element of surprise and remain calm during the storm, it glorifies our God and shines through to others allowing them to recognize there is always something to be grateful for. When we believe that God is in control at all times, and in all ways, we just have to remember that He loves each and every one of us and that His world is so much larger than our little world. Our lives touch so many other lives, that we don’t even realize the effect we could have someone. God knows though. He knows each and every one of us intimately and knows our every move before we even do. He knows how the chain effect will work, so we just need to believe that everything happens for a reason even when we can’t see the reason. We have to have faith and trust, but realize too that our attitude belongs to us and nobody can force us to have a good attitude or a bad attitude. Our decision-making powers are our own and we can decide whether to be happy or sad, miserable or joyful. The choice is yours. Just know with God, we will get through the storm with His guiding love, and for that alone, I am grateful! If we are going to make a change, we have to start with ourselves. Remember, we can’t change anyone, we can only change our reaction to situations. That’s why it is so important to look at ourselves in the mirror. What do you see? Regardless of how you might be feeling at the moment, whether you are still in your pajama’s, your hair is a mess, you have circles under your eyes, or maybe you just got back from the gym and you’re all sweaty and feel disgusting, we have to look deeper within ourselves. We have to remember that we are a child of God and He gave each and every one of us life. He gave us the desire and ability to live a life full of abundance. He wants the very best for each of us and it’s up to us to follow his lead. It is up to us to start believing that we are worth it! It might feel silly to go stand in the mirror and say to yourself, “I am a beautiful person”, “I am strong”, “I am determined and successful”, “I have a lot to be proud of”, or “I am in control of my life”. I could go on and on, but if we don’t change our attitude and remove the negative thinking, with only positive affirmations, we will just talk ourselves into feeling insecure, unloved, unsuccessful, unworthy, and weak. Do you remember a time when you woke up and just didn’t feel like going to work? You laid there and said to yourself, “I don’t feel good”, “I’m tired.”, “I just don’t want to do anything.”, “I really think I’m coming down with something.”? Sure enough, if you lay their long enough talking yourself into it, you will start to feel those things and you will just roll back over and go back to sleep. Instead, change your mindset. Ask God for the strength to get you out of bed because you know he has plans for you and any day with God is a good day! Granted there are some days that God just wants us to lay in bed because we have overdone it lately and our bodies need the rest, or we need quiet time to reflect on ourselves. I can’t tell you how many times God has laid me up because he knew I needed a break. At first, I feel like I was just thrown a curve ball, but then I realize, it was God’s Will. He knew I was overworked, worn out, and just needed time to rejuvenate my body and soul. I couldn’t be more grateful for those opportunities. You see even in our darkest hours, there is a light of positiveness. We just need to look deep enough and learn to see through the clouds because behind every cloud there is a ray of sunshine! The next time you are feeling down on yourself, or you don’t want to get out of bed and you are just trying to convince yourself to give into those negative feelings, that’s when you have to force your mindset to positive thinking. Dig deeper into the strength that God gave you. Take the high road. Instead start convincing yourself that you feel great, remember those affirmations: you are strong; you are determined; you are successful; you are loved; you are worthy! This morning, I started my day with God by reading a few days worth of my favorite book, “Jesus Calling” by Sarah Young. I’ll admit, I fell behind a bit and have some catching up to do. God knew that, as He knows everything, and as always, He spoke to me this morning and actually challenged me with a few tasks for today. Yesterday, I wanted something to Blog about, but nothing was coming to me. I prayed last night, and this morning it became clear. When God speaks to us in that soft voice we hear in our heads, we should always act on His plan! How many times have you heard in your head things you should do, but just brushed it off? I was always told as a kid that there is a good guy on your shoulder and a bad guy on the other, and that we should always brush off the bad guy. Today, I know that good guy is God and the bad guy, is the devil. I don’t know about you, but I always want the good guy to win! When we are hearing all of these negative thoughts in our head, who do you think that is? It’s the devil trying to pull us down! God is on our side, fighting for our attention. When you give your attention to God, God gives you the answers! He is fighting for us, so we should fight to remain faithful! Push those negative thoughts out of your head. No matter how bad your situation is, there has got to be something to be grateful for! Don’t stop until you find that one thing to be grateful for and then hone in on that thought. Then when you feel yourself slipping back to the negativity, hone back in on that one positive thought. Close your eyes and ask God to help you remain positive even though you may be feeling otherwise. While we are waiting for the tides to turn in our favor, we need to make preparations for the change with expectancy in our hearts! If we continue to believe it’s not going to happen, or something bad is going to happen instead…more than likely you are correct because you are allowing that negative thought to exist. Instead, ask God for what you need, act with expectancy that it will be and know without a shadow of a doubt that if it is His Plan, then it will be. If it is not His Plan, then trust that He has a better plan. Get over the fact that it didn’t happen the way that you planned, and know His plan is better, and it’s on the way. It may take a little longer than you thought, but it is coming. When you act with expectancy, the wait isn’t that bad because you know it is coming. Sometimes the anticipation is even more exciting than what you are actually waiting for! Think about it. Remember how exciting it was waiting for vacation to get here and then, just like that – it was over? You had more fun in your head dreaming and planning everything you were going to do. It got you through those bad days just knowing your vacation was coming. It’s time to put your faith to work and start believing, start expecting good things to happen, and take actions to prepare for His Will to be done! Listen to what He is saying, for He is the ‘good guy’ on your shoulder guiding you and preparing you for a life of abundance. Don’t let the bad guy win!